I'm taking a little break from the leaves for now. Apparently it got weird. Last night Max knocked over my glass of water when Caleb was setting the table for dinner (Max tries to be helpful). Caleb and I got the water all cleaned up but my leaf was sopping wet so it had to go sit by the kitchen sink. Once everything was dry and the table back together, I grabbed another leaf out of the drawer. Caleb just looked at me and said, "Mom! You made backup leaves?" This was followed by an eye roll of course. So it was a good thing I had stopped making leaves for a bit. I'm still not ruling them out for gifts - if you're on my gift list and feel strongly either for or against leaves (or have color preferences), now is the time to let me know. Anyway, I needed something to do Friday, but I didn't want to start a huge project because tomorrow is May 1 and that means a new Knit Something of the Month project. So I decided to knit a quick pair of socks. This is my second year in the Rockin' Sock Club by Blue Moon Fiber Arts, but I haven't knit any of the yarn I've gotten in the club. (I like most of it, but just haven't started anything. Even the ones I'm not crazy about will push me out of my comfort zone, which is always good.) The yarn I chose is Budding Twig - the March club yarn (if you are international and haven't gotten your yarn yet, this is your spoiler warning - don't scroll down any farther). It's the Medium weight Socks that Rock yarn and I just fell in love with the colors. 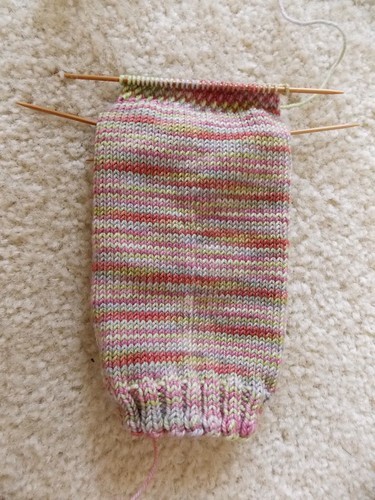 I started this sock three times (I was hoping to have a finished sock and a half for today) and first it wasn't going to be big enough, then I was getting weird pooling, finally I settled on a plain vanilla sock, just stockinette, and I love the way it shows off the colors. Did I mention I love the colors? So Springy and happy! I decided to do an Eye of Partridge heel because that's my favorite heel flap, but otherwise this is just a simple, easy sock. Oh, and in case you're wondering, Max is just out of frame - making the shadows at the top of the sock - helping never gets old for him. Thanks to everyone who joined Dropbox through my link! The link doesn't expire so if you're on the fence, take some time to think it over. Sharon left a comment explaining how she's using it and I'm using it the same way. All of my pdf patterns - my own and patterns I've purchased are in Dropbox. This way if I'm out and I find a great yarn for a certain pattern, I can pull up the pattern on my iPhone through Dropbox and see how much yardage I need. If I forget to bring a pattern with me that I'm knitting (or something happens to it), I can pull it up. Ever needed one of your patterns on vacation because you're dying to start something new? And of course, like I mentioned the other day, it will work with Knit Companion on the next update, so if you have that, it will be even more useful. I'm not going to keep babbling about it every day, but I realized that I didn't really explain what it was the other day, so I thought I'd mention how I'm using it. Ask, and you shall receive. If you're my son, and your request is reasonable. (Did I ever mention that he wants chickens so he can have fried chicken anytime? Not happening.) I made him a red leaf though, as he wanted. I figure in another week or so Max will have stolen all the leaves and dragged them off to his stash (under the bed). He's still occasionally stealing things, but he's not as bad as he was when he first became part of the family. I don't know how many more leaves I'll do (they're fun, I'm just not sure how many we really need before it gets weird around here), but they're using up some extra cotton yarn that was just sitting in my stash. I could also make some as gifts for people on my gift list (be warned!). 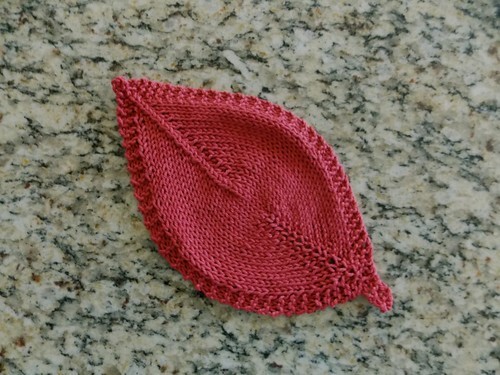 Since I finished the capelet, I didn't want to start anything big (May is coming and that means a new project of the month), so I made a few more leaves! I made all three of these yesterday afternoon and evening, wove in the ends and got them blocked during commercials on Deadliest Catch. 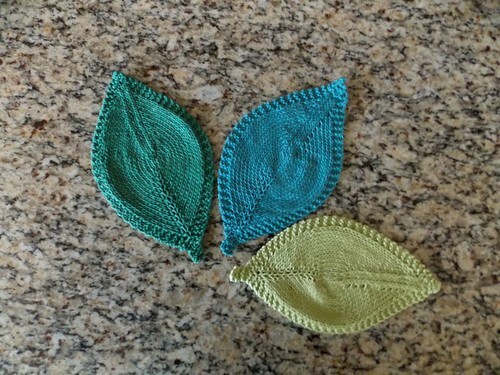 These are the same yarn as the first leaf I made (Sinfonia 100% cotton from Hobby Lobby), so I now have four leaves the same size. It's a leaf making factory around here - maybe I'm becoming a tree? Caleb saw the leaves blocking and announced he wanted a red leaf of his own. Fortunately, I have red cotton yarn so I can make him his very own leaf. I think these could also be cute in wool and then felt them a little so they fluff together. I can see some felted, white wool leaves holding mugs of hot cocoa! Yesterday was also the day I made the Spring plant run. I got my yearly geraniums and I also got some herbs to tuck into the strawberry pot. 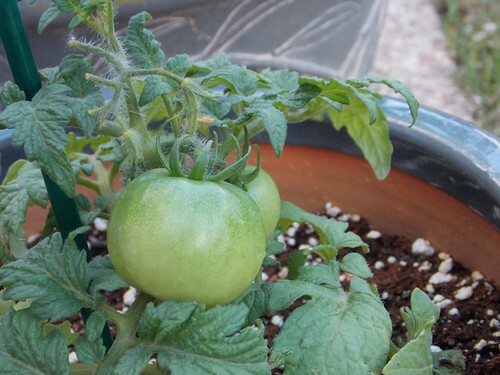 New this year are two tomato plants! I've never done tomatoes before but with some advice from the ladies at the plant place, I think this might work. I've got them in pots (they're bush tomatoes, which is apparently the way to go if you're growing them in pots) on the patio. Logan is fascinated by the new additions to the patio and if dog spit is good for tomatoes, we're going to have some really happy tomatoes around here. They get kisses every time he walks by. He's also interested in the herbs and particularly likes to snuffle the lavender. Smart dog! The White Cranberry Capelet is all done! It needs a little blocking with the steam iron, but you can see how it came out. I made the small size and I used Quince & Co. Lark in the Egret Colorway. Loved the pattern and the yarn and I'm sure this is going to get some wear if we have an actual Winter this year (unlike this past "Winter" which really wasn't Winter at all, except by the calendar). You can see by the shape that it flares nicely and won't restrict my movement. 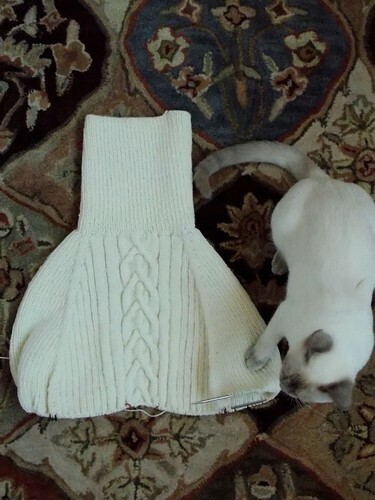 Overall, a quick, fun project to knit! This is what I did. There was mud. Everywhere. No broken bones, still have all limbs. 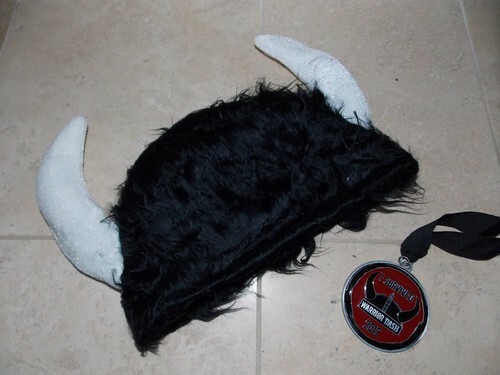 Now I have a fuzzy, horned hat and proof that I survived Warrior Dash 2012! 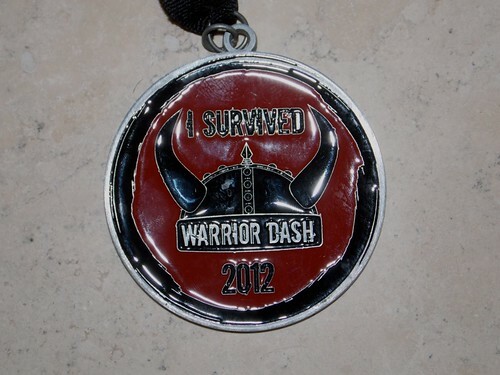 It was fun and I'd do it again! I took a break from the White Cranberry Capelet yesterday, so you get a break from it too! I whipped up this little leaf to show you today. 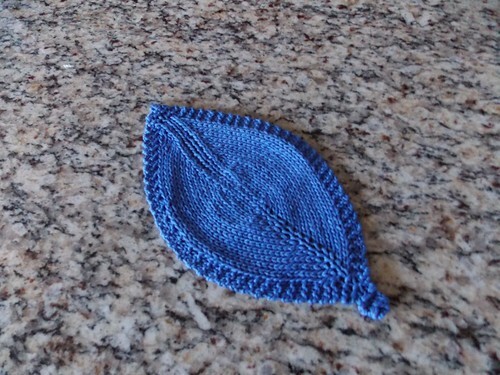 The pattern is called Leafy Washcloth (free!) and it's just a simple little leaf. 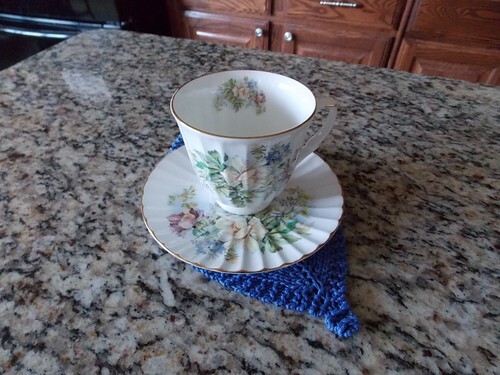 I'm not going to use mine as a washcloth though, I'm using mine as a coaster. It worked up very quickly (about an hour, tops) and I just used some cotton yarn that was leftover from another project. I also have some green yarns, so I'll probably work up some more of these just for fun (and I'm always looking for something to put my tea on). This was a fun, quick project and now my tea is sitting on a leaf! I'm still going on the capelet. I did try it on yesterday and I like the way it looks, but I've got a little bit farther to go, to get it the right length. Quality control is still on the job. 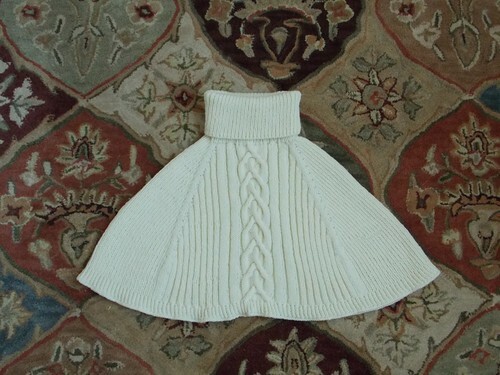 I'm wondering if I'll be allowed to photograph knits without one or the other of them, ever again. On the other hand, if Max wasn't holding the capelet down, it could have easily walked off and then you'd just get a picture of the rug. Not much to blog about the rug, so it's a good thing he's anchoring the knit! 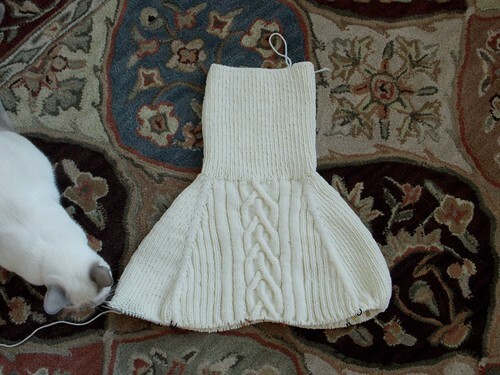 I've gotten a lot done on my White Cranberry Capelet! I'm to the point now where I need to put it on a longer needle (or two) and try it on to decide how much more I have to go. Also, it wouldn't kill me to weave in some ends. So far, they're all dangling inside the capelet. I think this is going to be cozy, warm for our cold, Texas winters. As you can see, there was a surprise needle inspection this morning - they passed. I have no idea what prompted the inspection. 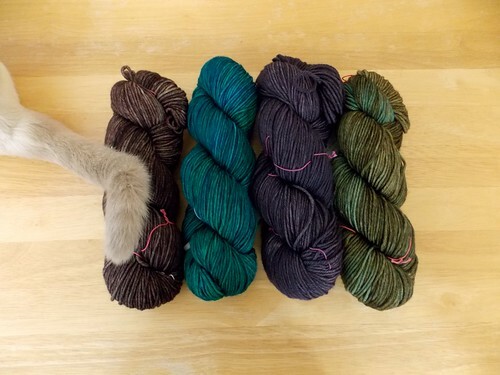 I got out my knitting, got one picture taken, and when I started to take the second picture, the inspector had shown up. He checked needles for the remainder of the photo shoot. I'm still working along on my White Cranberry Capelet, but I'm past the turtleneck now and on to the increases and cables! I've added a few markers as well (at the top left of the photo you can just see my little lemon marker - that's my round marker). 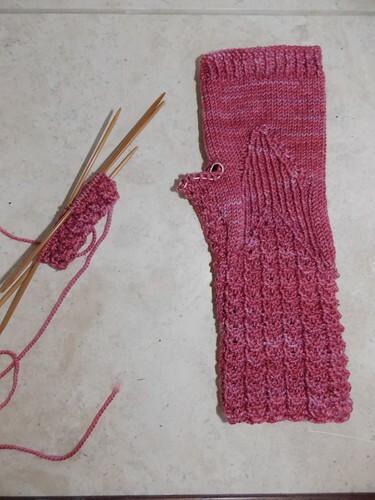 This is a very well written pattern, and even though there's a lot going on at once (several different ribbing patterns, cables, and increases), it's not hard to work. I've got it loaded into Knit Companion and I'm just knitting it straight off my iPad. (If you have an iPad, you should take a look at Knit Companion. There is a Ravelry group with plenty of support and information if you need it. I haven't tried it on my iPhone, but it also works on iPhone. Oh, and I have no affiliation with Knit Companion, I just think it's pure genius.) I worked the Dragon Rider mitts in Knit Companion too. Maximus likes it when I knit from the iPad because its the perfect height for scratching his chin. I knit, he purrs and loves on the iPad. 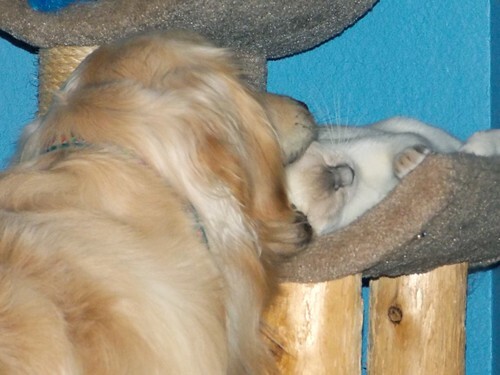 No, it's not another doggy hat, and I got the photos working again! 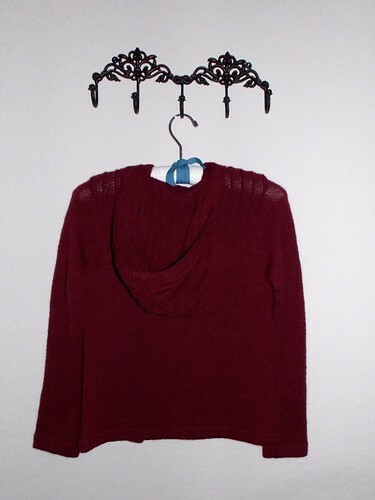 This is the Cranberry Capelet. (Which is just a nicer way to say poncho - last Fall and Winter, Nordstrom's carried capes, not ponchos.) I loved the look of it when I first saw it and went and bought yarn for it, but I was making myself finish up the Austin Hoodie first. The yarn I'm using is Quince and Company's Lark in Egret. This is the first time I've used a Quince and Company yarn, but I will definitely be using it again. It's just a lovely yarn. It's not quite as soft as pure merino, but it's still very soft. It's hard to describe, but there's almost a crispness to it or something. You know how silk charmeuse and velvet are both soft, but there's a little bit of crunch to the velvet? It's like that. Probably the easiest thing to do is just buy some. You can thank me later. What you're looking at is the top turtleneck section of the capelet. It's knit in a rib, and it's pulling in right now as ribs do. (Apparently in the pattern photos she blocked the neck pretty aggressively to give it more of an oversized/cowl kind of look.) I used a tubular cast on for it, since it starts out ribbed and the cast on edge will be right next to my face. I thought it would look nicer and more finished instead of using my bog standard long tail cast on, and I'm glad I did because I do like the way it looks. Also, I can't stop squishing my knitting. Did I mention I love this yarn? Last night I did the impossible - I frogged mohair. I had decided that my Horai needed a trip to the frog pond for a couple of reasons. I wasn't happy working it on my slick metal needles, but it matched the colors too closely on the wooden needles for me to use those. (Double stranded lace weight mohair and working the daisy stitch require you to be able to see what you're doing.) Also, I'd made some mistakes back at the first of it that I couldn't see at the time (so I went on after correcting as well as I could), but I can definitely see the problems as I got farther away. Finally, my cast on was too loose. All of these things were combining to make this project one I wasn't working on because I knew inside that I'd never be able to wear it. I decided it was worth trying to frog even though I've always heard you can't frog mohair. I found out last night that if you go slowly and carefully (and you've knit the project to be frogged on enormous needles), and your kitten has worn himself out "helping" with laundry all day, it is in fact possible to frog mohair. I did have to toss the last few yards - the parts from the original cast on, but otherwise, I got all the yarn back. I do love this pattern and I love the yarn, so it's entirely possible that I'll get some new needles (wood, in a lighter color) and restart. Now that I have a feel for the pattern, it should be easier to work a second time around. In the meantime, I know frogging it was the right thing to do. I've finished my April Knit Something of the Month Project! 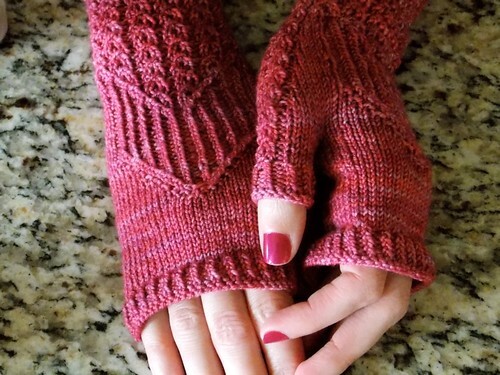 These are the Eragon mitts, knit in Madelinetosh Tosh Sock in Cherry. I just ribbed the top of the mitts instead of doing individual half fingers. This was a well written pattern, easy to follow and worked up quickly (I started these on April 1 and finished them on April 7). I'll be tucking these away until the weather cools off. But today we're not looking at the crochet, we're looking at more yarn for the crochet. I weighed one of my skeins of yarn before I started using it on the blanket and then I weighed it after I'd finished the repeat for that color. Each repeat takes 48 grams of yarn so I can get two repeats from each skein. (We will not discuss the chance of any of the skeins being underweight. No, it will be fine.) 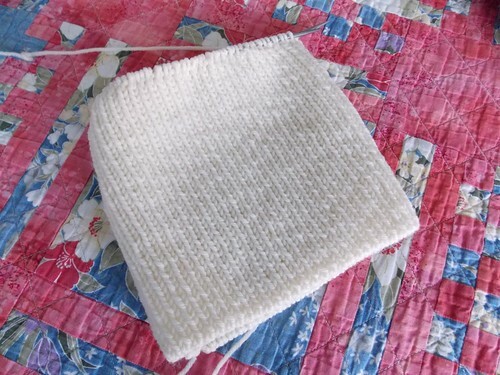 When I measured some and did some math, I figured out that I would have a blanket that was pretty close to square. I didn't want a square blanket, I want one that is longer than it is tall because that is how the person who is getting this blanket is built. So I needed more yarn. I will wash these skeins over the weekend and add them to the giant bag of yarn and work these new colors in with the others and then I will have a rectangular blanket. These are all Madelinetosh Tosh DK yarns, just like the rest of the yarn I'm using for this blanket. From left to right in the photo, I have Max's tail, Kale, Forestry, Thicket, and Terrarium. Why Max felt his tail should be in the shot, I don't know. Max wanted to show off his new doggy hat. Oh, and there is purring. Lots and lots of purring. Just a normal Wednesday evening around here! It is completed! I began this on May 1, 2011 and I finished it, bound off and ends woven in on April 1, 2012. Yes, it took me eleven months, but for the life of me, I can't tell you why it took so long. It wasn't a difficult knit, but it wasn't one that I could just pick up and put down either. I always had to read the pattern a little before I restarted and that probably had something to do with it. 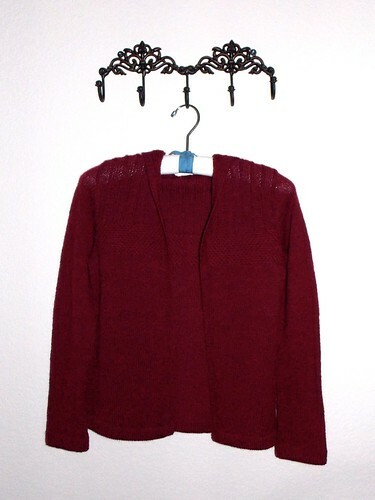 I knit it in Elann's Peruvian Baby Cashmere in Claret. I followed the pattern except for the lower sleeves where I forgot to double check the pattern and just continued them in stockinette and added a hem. 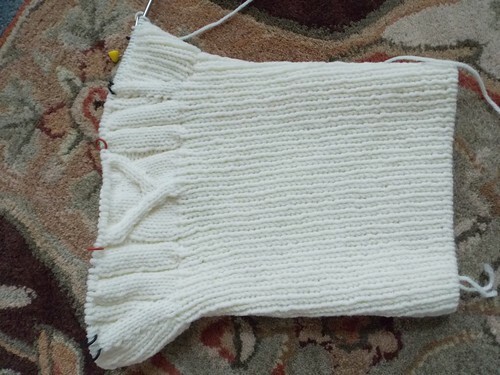 (They were supposed to be in the same rib used at the top of the cardigan.) I love the way it fits and the yarn feels soft, but there was no one here to get photos, so it's on a hanger that's wider than my shoulders are. It's also seriously overcast here this morning, so getting details on this dark red is next to impossible. 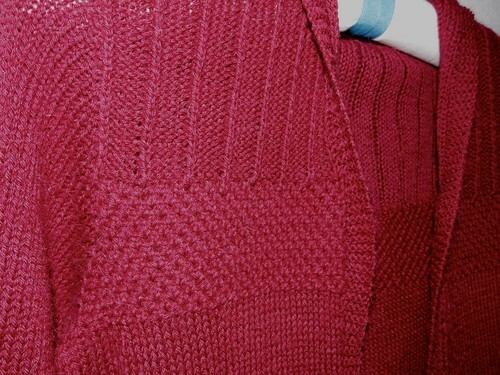 I did get a detail shot of the stitch textures though (the color is more accurate on the full garment shots). I'm glad to have this all finished, but I'm going to wait a bit before I start another cardigan. April is here! 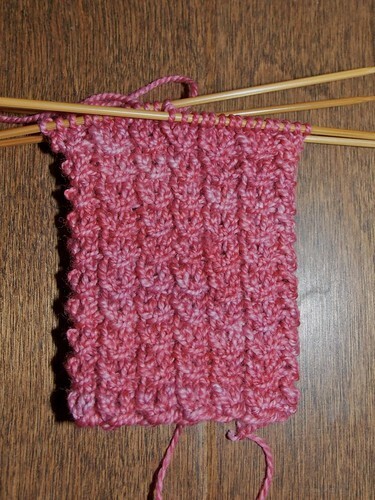 That means I get to start my April Knit Something of the Month project, so I did last night. This is the first of my Eragon Mitts, made in Madelinetosh Tosh Sock in Cherry. This is the entire cuff and I'm ready to start the hand part on the next round. Know what else is new around here? I've got a new camera! This one runs circles around my old one and I think it's probably smarter than I am. I've got a lot to learn about it still, but hopefully I'll be able to get better pictures. It's a lot faster and has a burst mode on it, so at the very least I should get actual pictures of Logan and Max instead of pictures of where Logan and Max have been. Tomorrow, we celebrate the completion of something 11 months in the making!